Positive Vibrations Sound & Pure Anywear's Winter Roots Reggae Series continues with Army & Ark Aingelle on December 15th, Abja & Ras Attitude on January 11th and we have just added General Smiley of the legendary duo Michigan & Smiley on February 2nd. All shows at Cooper's Ale Works in Nevada City backed by full band lead by Tuff Lion with DJ Treez on selections. The Kolumn show was a big success and the plethora of artists that hit the stage put on amazing performances. Give thanks to Nomo for coming all the way up and filming the entire show. Look forward to some great footy. Ya that was fun, the first set was an hour and forty minutes alone. I got home at 4 am. Hope Army makes his way down south in CA. Pretty good venue, outdoor smoking section feet from the stage. I would not miss Army and Arkaingelle. Gettin me a hotel room this time. Going down this Saturday. Two sets with full band lead by Tuff Lion. Check it. Great Footy, give thanks NOMO! Looking forward to Abja in a few weeks! Abja cannot make it, but we are having Ras Attitude and another showcase. Official poster soon come. Edited 1 time(s). Last edit at 01/01/2019 02:22AM by DJ Treez. Edited 1 time(s). Last edit at 01/06/2019 03:11AM by nomotrouble. Yes Friday the 11th, I'll edit the post with the right day as soon as I get the edited poster. Attitude playing any other shows in the area? Ras Attitude & Tuff Lion will be playing an acoustic band show at the Redwood Cafe in Cotati on Friday Jan 18th from 830-11 and its not all ages but at least its 18+ Flyer n more info coming soon! Hoping attitude gets picked up for a couple more shows , been a while since I seen him perform and brig full energy. Wow. Blaak Lung. Noble Culture. Ras Attitude. Tuff Lion on bass this time. Walker with a different guitar. 'There's Police in our yard, I'm a refugee. In my own country.' from Noble Culture's song 'Refugee'. Ras Attitude smart and professional, played an hour and a half from 12.30 til 2 am. I'm gonna really try and make he and Tuffy's acoustic show next Friday. On another note, i'm trying out the cheap hotels in Nevada City. Cheapest was the Nevada City Inn, 85 bucks, noisy as all get out, had to wear earplugs even at 2.30 am to get to sleep. This week i tried the Piety Hill Cottages, 110 bucks. Much better, older like the Nevada City Inn, but real quiet. They will bring breakfast to your room if you want it also. Only hang up is they want you to check in before 6 pm. Next i might try the Northern Queen, not sure though. National Hotel still being rebuilt. Edited 1 time(s). Last edit at 01/13/2019 11:28AM by nomotrouble. I am really close to confirming an EPIC artist for this series on Feb 22. SAVE THE DATE. This will be LARGE! We also have another local artist showcase on March 29 and Ras Iba on April 13 lined up. Morel details soon come. Holy Guacamole Treez! I cannot miss Kabaka and the Bebble Rockers. the last friday almost killed me, but this one will be epic, gotta be there. I'll have to head up there for Ras Iba... always wanted to see him! Iba is worth the trip. This Saturday my friends. It's looking to be a great show. The series is definitely popping off. Come out and checkavibe. Treez, i've been cut down by an eye infection. Its going away but slowly. I'm going to have to see how i'm doing come this weekend. Nomo. I am really sorry to hear. Please take care of yourself brother. We hope to see you but absolutely understand if your personal health takes priority. Blessings. Hit me up, Nomo - We're just 10-15 minutes south and usually have a spare futon. Give thanks to the Massive & Krew for providing a fabulous turnout last night at General Smiley even in inclement weather. Vibes were large. We had a host of amazing artists hit the stage & bless the mic and of course the band was on point as usual. Smiley is a true veteran. Koro Fyah will be joining the party at Nevada City and the vibes will be elevated. Please don't miss this one if you can, it will go down as legendary. Advance tix highly recommended. Definitely hoping to see some of you on Friday. This will be one for the books. Koro Fyah will be doing a short opening set. Acoustic opener with SoulMedic & Noble Culture starts at 9:45 and Koro/Kabaka around 10:45. That refugee Noble Culture song was fire! More Noble Culture! Noble Culture will be headlining on March 29. Thanks all for coming out last night. What an amazing turnout for an incredible performance. Next up is The Clarks All Star Band with a whole heap a artists passing the mic on March 9. Poster & details soon come. Bless. Yes very good show. very good vibes. had a blast. thanks for the CD, but someone took it alongside some of my clothes! Edited 2 time(s). Last edit at 02/27/2019 02:25AM by DJ Treez. All shows backed by The Clarks All Star Band led by Tuff Lion & Walker at Coopers Ale Works in Nevada City with two sets & DJ Treez on selections. We really appreciate the support we have been receiving. If you have not checked the vibe yet, please come out for one of the above shows and see how we do it. The Vibes are always large. i back that up! very good vibes. i may come for another one of this show! i wanna go see em all. Got some issues though might keep me from March 9, but i really don't want to miss march 29 or any of the other ones for that matter. The vibes out there are huge. This is a series that should not be misses, Tuffy and Walker holdin it down. Hey yo, even with the crowds we have been drawing, Coopers does not want us there anymore. Too much pot smoking and not enough drinking they say. As a result, we have pulled all shows from the venue and are already lining up alternative venues. Kulcha Knox will be performing at Culture House Collective on March 30. More details soon come. Give so much thanks for all the support. We are motivated to move forward with the movement despite the Babylon interference. Blessings. 'Too much pot smoking not enough drinking' sounds like my kinda place! Oh well, next venue! Man Cooper's does that every time - as soon as a regular series gets established, they pull the no weed card. Hypocrites. No Culture, No class. Edited 1 time(s). Last edit at 03/26/2019 10:03PM by DJ Treez. I hope to see some folks tomorrow night. This is a new venue and the vibes are right. All ages, Ital food and there is alcohol, but it's not a bar. Grizz is even gonna spin some vinyl. Next up is Kurrency King on 5.11 and Ark Aingelle on 5.25 at Crazy Horse in Nevada City. You heard it here first folks, we are planning a mini festy on 6.22 in an attempt to fill the gap. It will be really rootsy and we have an amazing outdoor venue confirmed not too far from Grass Valley. More info on this soon come. what time we talkin Treez, i'm hoping to make it tomorrow. Looking forward to seeing you Nomo. Kicking things off at 9. Imma roll in a liitle late. Nice set and a nice venue! Give thanks. Good to see nomo, Treez and Haile Conscious in the mix, recording, spinning and vending. Looking Forward to the next! So does this mean no Ras Iba on April 13? Great show last night, killer venue. Nice to see you too Evan! Yes, he had to cxl, so we were unable to reschedule that one. Wake the town and tell the people! 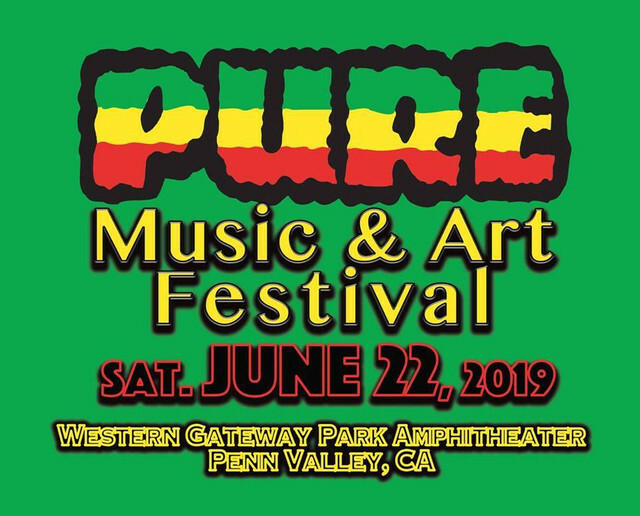 The Pure Music & Arts Festival is on for Saturday June 22nd at the Western Gateway Park Amphitheater in Penn Valley California. Line up soon come but The Clarks All Star Band will be in full effect with a variety of artists and a legitimate headliner. DJ's, MC's, vendors, kids zone, a river, shaded pavilions and plenty of free parking. This will be legit people. Edited 2 time(s). Last edit at 04/19/2019 03:54AM by DJ Treez.